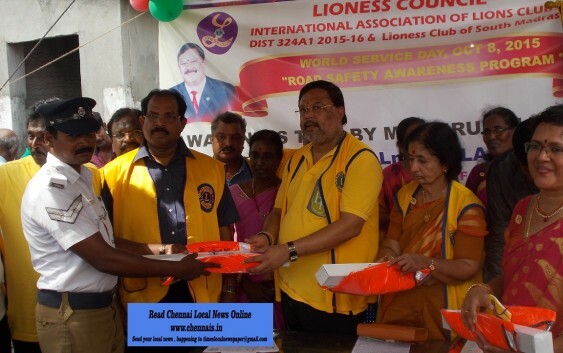 The members of Lioness Club of South Madras and Lioness Council jointly distributed free reflectors jackets, baton lights and mask to the 25 traffic policemen attached to R4 Soundarapandiayanar Police Station during ‘World Service Day’ program organized at North Usman Road and Mahalingapuram Road junction in T. Nagar. Mohana Gnanavel (President, Lioness Club of South Madras) said that traffic regulating articles was given by G. M. Balaji Rathnam (Governor, Lions International District, 324 A1) in presence of R. Ravi Kumar (District Chairperson, Lions Council), officials from Police department and other eminent personalities. She said that members also distribute traffic awareness pamphlets to the motorist and also pasted cat eye stickers on the headlights of vehicles on the junction.